Because of our versatility Britannia have taken part in many projects that constitute a total departure from our normal historical periods. We’ve played Stone Age people, for TV’s Horrible Histories, provided Republican Romans for TV’s Battlefield Detectives, time-travellers in BBC’s adaptation of Neil Gaiman’s Neverwhere (Crucial Films) and were called upon to reconstruct and demonstrate a floating cork filled tunic used by the spy Pontius Cominius in a programme about ancient espionage and stealth technology (Wild Dream Films 2008). 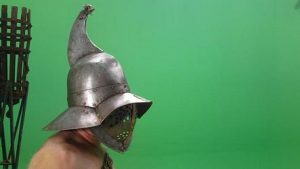 Recently, as part of our research into gladiatorial games, we have looked at the origins of this spectacle and have reconstructed the equipment of captured Thracian prisoners of war as well as other cultures that encountered the Roman military machine in the first Millennia BC, these include Gauls, Germanic tribes, the people of Israel and Macedonians. Our professional approach and attention to detail remains the same. We are also happy to pass work on to societies and specialists we feel can handle the job appropriately. 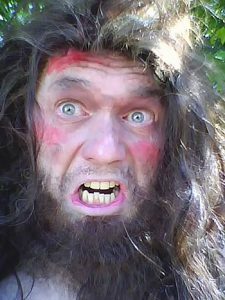 This approach has paid off on projects such as TV’s Horrible Histories where a versatile attitude and a willingness to assist in the reconstruction of a whole variety of time periods and subjects has seen us working successfully with the production team for the past four series. 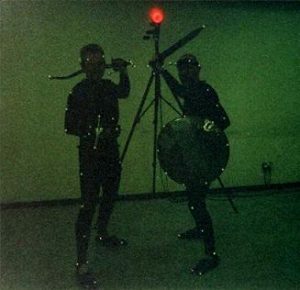 We’re more than happy to work in studio environments embracing new film technology such as motion capture (left) and green screen (below).